Casinos face higher taxes in three years' time, when the Government will take up to 22 per cent of their gross gaming revenue under a new tiered tax structure. These changes come as both integrated resort (IR) operators announce their intentions to invest $9 billion into building new world-class attractions, such as a 15,000-seat entertainment arena and extensions to Universal Studios Singapore. Marina Bay Sands and Resorts World Sentosa have also been given the green light to expand their casino operations, and have had their exclusive rights to run a casino here renewed until the end of 2030. Currently, casinos are taxed 5 per cent of gross gaming revenue for premium gaming involving high-rolling patrons, and 15 per cent for mass gaming revenue. These rates are locked in until February 2022, after which a new tiered tax structure with higher tax rates across both categories will take effect. 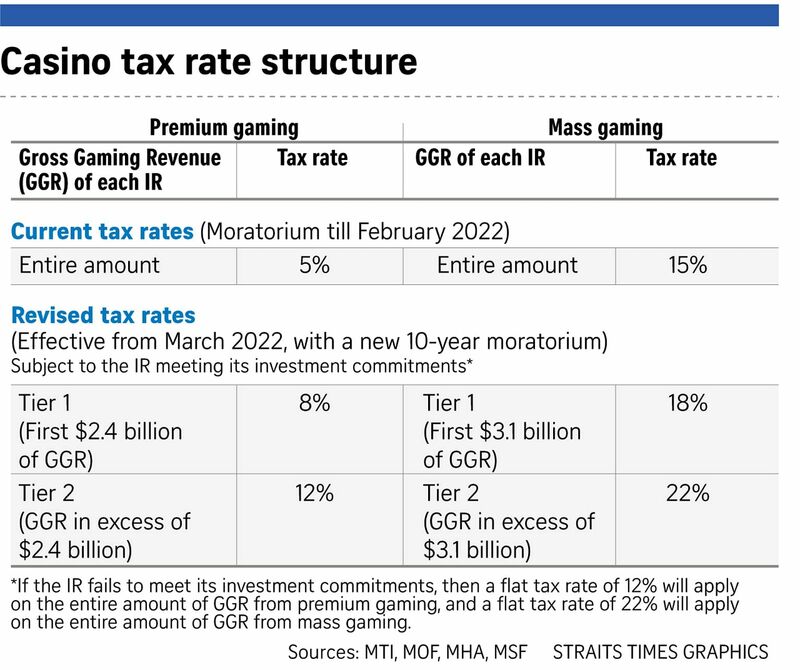 The first $2.4 billion of premium gaming revenue will be taxed at 8 per cent, while anything above that amount will be taxed at 12 per cent. Meanwhile, the first $3.1 billion of mass gaming revenue will be taxed at 18 per cent, and the rest at 22 per cent. These tax rates will be locked in for 10 years, provided that the IRs meet their investment commitments to build the new attractions, said four ministries in a joint statement yesterday. If they fail to do so, they will have to pay the higher tax rate in each category on all their gaming revenues. The statement was put out by the Ministries of Trade and Industry, Finance, Home Affairs and Social and Family Development. In order for the new attractions to remain commercially viable, the IR operators have also been allowed to expand their casinos. But the caveat is that any additions should be targeted at "higher-tier non-mass market players, who are mainly tourists", the statement said. If the IRs do expand their casinos to the maximum allowed, it will increase the current gaming space from 30,000 sq m to 32,500 sq m.
But with the even bigger expansion of the non-gaming areas, the space taken up by gambling operations at the IRs will shrink from the existing 3.1 per cent to 2.3 per cent. The Finance Ministry said that the total revenue from betting taxes in the last financial year was $2.66 billion. This included money from casinos, lotteries, horse and sports betting and fruit machines, and was 3 per cent of the Government's overall revenue of $90.11 billion. CIMB Private Banking economist Song Seng Wun said casino taxes make up only a small part of government revenue in Singapore. "The largest components are still corporate income tax and goods and services tax," he said. "In recent years, property-related taxes have also grown." Mr Song added: "Betting taxes have remained quite constant. I think the betting industry here has stabilised over the past decade."